Winning races is what Moore does best, he scored a division best “most wins” in both 2009 and 2011. Dylan also can step up when the pressure is on, he won the Big 8 Late Model series invitational event during Thunderstruck93 in 2012. On Saturday night at Elko Speedway the Big 8 cars will go five laps in group qualifying, with times being scored off their transponders. The fastest car will score 15 points, second fastest 14 points and so on… all the way down to 15th getting 1 point. So qualifying is very important in the point standings. 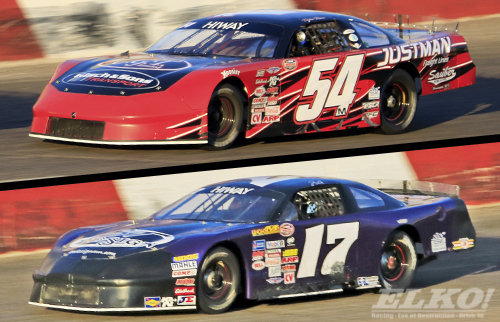 Expect to see high car counts and some extra big name drivers at Elko Speedway on Saturday night (September 17th) as drivers will want to prepare for the upcoming Thunderstruck93 ARCA Midwest tour and BIG 8 Late Model series events on September 24th. Also racing are the Genz-Ryan Thunder cars, Pepsi Power Stocks, Hornets, Great North Legends and the Bandoleros.